Viagra on NIGHT AND DAY. Carbonless Forms on HERE'S ONE I PREPARED EARLIER. Spokane Car Insurance on FLOWER POWER. Weber Grills on HERE'S ONE I PREPARED EARLIER. Justin Bieber Shoes on HAY HAY IT'S DONNA'S SUMMER DAY! Affordable Medical Insurance on IRISH-AMERICAN. Affordable Medical Insurance on FLOWER POWER. I don't know if anyone has noticed that I've been able to get much better close-up food shots recently (ahem) but if you have, it is nothing to do with my honing my photography skills, such as they are, and more to do with the fact that my brother has let me borrow his fancy schmancy digital SLR camera. It comes at the small price of having to come up with a few healthier recipes than I would normally post (I suppose there's something to be said for a balanced diet). My brother works for a organisation called Red Branch who are on a Jamie Oliver style mission to raise awareness of the importance of diet in childrens lives. Fortunately, they do this in a way that doesn't make a parent feel negligent by giving their child a cookie. Their aim is to educate rather than point a critical finger (though they pull no punches with the shocking stastistics that have taken on epidemic proportions in the last decade) and so, the deal is that I occasionally restrain my chocolate-coated urges and do some good wholesome cooking so that when they eventually get the recipe page of their site up and running they'll have some photos to get them started. As speed is the first thing that parents ask for when it comes to a healthy snack, the first thing I decided to make was a smoothie. As a parent staring down the barrel of the summer holidays I can sympathise with the desire to get something decent into your offspring with minimum effort and minimal whining. Producing something packed full of fruit that looks like a milkshake is a cunning way of achieving this. Frozen fruit is a suitable alternative to fresh, not only is it cheaper but it is not going to dissolve into a mouldy pulp if left unattended behind the bag of mixed salad leaves in the fridge. Usually I go for raspberry or blueberry made with defrosted frozen fruit and a banana thrown in for a little potassium. There are only two ways of getting me to eat a banana... in a banoffi pie and in smoothies. Okay, maybe a banana split with extra chocolate fudge sauce... Where was I? Oh yes, nourishing smoothies. This recipe is one I spotted in the back of Oprah magazine of all things, while flicking through it in the shop. The ingredient list said melon, banana and vanilla yoghurt which I repeated like a mantra all the way home (my short-term memory is not what it used to be). A whole honeydew melon to one puny banana may seem like a lot but the flavour of the melon is sweet, but easily overwhelmed so this ratio gives the melon a little breathing space. The vanilla speckled yogurt compliments the two fruits and as the Glenisk brand I used is both organic and low-fat I feel I'm earning my 8 million pixels. I know you probably have a favourite smoothie recipe of your own but give this one a try this weekend... curly red straw is optional. 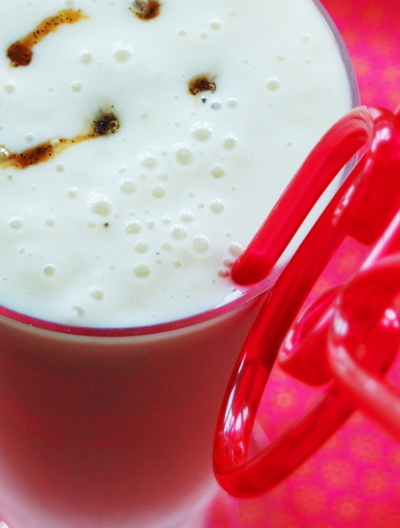 Just blitz everything together in a blender and pour into tall glasses. Makes 2 large or 4 medium smoothies. Apologies for the lightning post today but I've been working like a dog all week (whinge, whinge, moan, moan) and I won't have the chance to cook, never-mind photograph, anything for the next few days. This is my sacrificial tribute to my little one for denying her a trip to Eddie Rockets. Not only because I was chained to the oven all day (did I mention moan, moan, whinge, whinge?) but also because fast food can only be an occasional weakness and I don't know if I'll make it through the easter holidays without caving. I admit it I like the onion rings! Anyway, they recently added an Oreo milkshake to the menu and who wouldn't be seduced especially when you add the whipped cream and the whole Oreo on top. And, as this is my second Oreo inspired post (with more to come)I think we may be developing a little Oreo habit of our own. I suspect Eddie Rocket's make theirs with cookies & cream ice-cream blended with milk. This one gives more oreoishness (sod the spellcheck it's a word!) 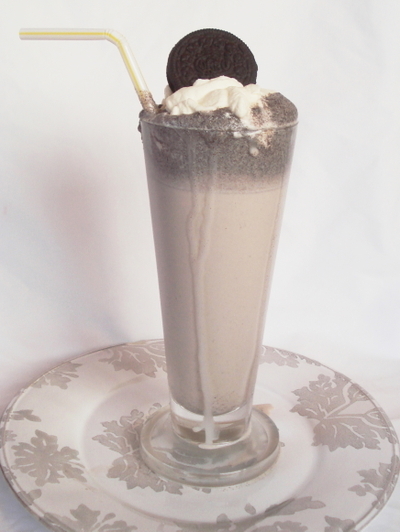 and less straw-clogging by blitzing whole Oreos, vanilla ice-cream, milk and a couple of ice-cubes. You could take it to a whole other level by using chocolate ice-cream. Possibly not the most intelligent close to bed-time drink for a child just granted two weeks freedom but it's still relatively early, I'm sure she'll be asleep by this time tomorrow. Hope to rejoin the human race when I can string two words together. Blitz a large scoop of vanilla (or any flavour you choose) ice-cream, 2-3 broken Oreos, about 200ml of milk and a couple of ice-cubes in a blender until smooth. Add more milk if it is too thick. Top with a dollop of whipped cream and a whole oreo for munching. Ice Cream Ireland - Of Murphy's ice-cream fame! Vals Kitchen - Fabulous food and adventures for foodies. A little bit of everything here including, most importantly, plenty of chocolate. The Book Depository - Cheap books with free delivery worldwide !! !